The United States was tragically unprepared for World War I. Woodrow Wilson's slogan for re-election in 1916 had been “He kept us out of war,” which most Americans endorsed at the time. But when war was finally declared war on April 2, 1917, the isolationist attitude would mean that American armed forces were undermanned and ill-equipped. The European powers, on the other hand, had developed advanced weaponry — artillery, tanks, machine guns, and airplanes. It would take the Americans time to catch up. 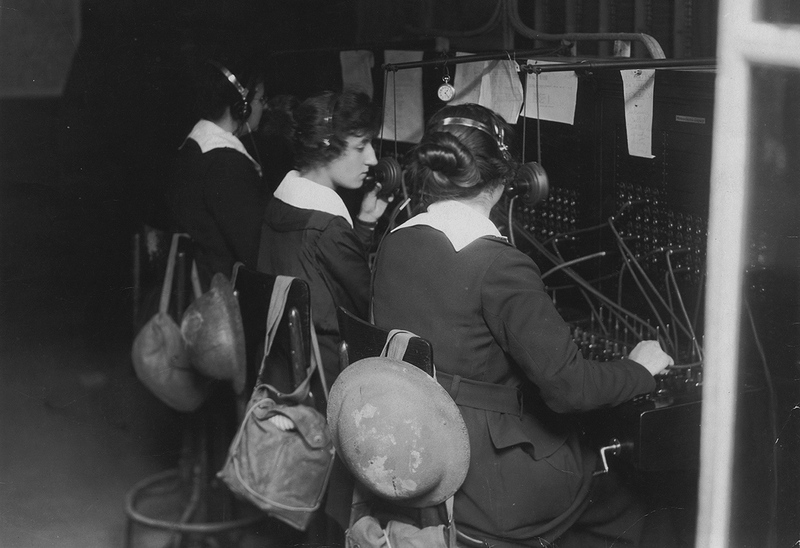 Women operated the telephone switchboards that allowed military commanders to understand and control what was happening, even in front-line headquarters under threat of artillery fire. Operators kept their gas masks and helmets close. Communications was the one area in which the U.S. led the world, with an estimated 70% of all telephones found there. In 1915, forty years after Alexander Graham Bell invented the telephone, he spoke across the continent in a ceremonial call to his old colleague, Thomas Watson, in San Francisco to inaugurate the first transcontinental telephone line. It was a remarkable achievement, allowing the speaker's voice call to zig-zag across the country through countless local exchanges stitched together to carry a single transmission. Newly invented repeaters amplified the faint telephone signal enough for it to reach up and over the heights of the Rocky Mountains. Telephone companies soon discovered that women made better operators than men. They were polite to often-irate customers, and more dexterous with complex switching technology. Telephones also revolutionized warfare. Soldiers could fairly easily run a telephone line across fields to connect forward units with headquarters. Commanders could receive up-to-the-minute news, communicate orders, and request supplies from depots that might be hundreds of miles away. The primitive radios at the time could not yet carry voice transmissions, only Morse code. Radio signals reached only a few miles on land, and could easily be intercepted by the enemy. So telephones became the critical means for command and control for the U.S. Army. Signal Corps soldiers ran telephone wires even to the most forward positions. 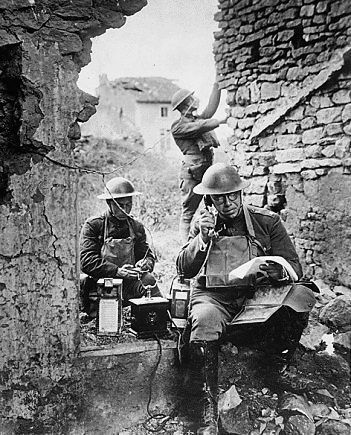 Radios were too primitive to be used during World War I. It was soon discovered, however, that the young men in the Signal Corps were generally unable to handle the complex multitasking required of a switchboard operator. The Bell companies had discovered soon after the first telephone exchanges became operational in the 1880s that women made the more capable operators and exchange supervisors than men. They were also more patient and able to calm down customers frustrated with the challenges of primitive telephone communication. The relatively well-paid employment of tens of thousands of women across the country by the telephone industry would have a profound impact on society. Gen. "Black Jack" Pershing insisted on having the best telephone systems available, and that would include the most experienced personnel. So he overruled his top brass and did the unthinkable: he ordered the Army to allow women operators to signup for wartime duty and handle the switchboards in Europe, even if it meant working in forward-positioned exchanges close to combat. The intriguing story of the women telephone operators of World War I is told in The Hello Girls: America’s First Women Soldiers by Elizabeth Cobb recently published by Harvard University Press. Dr. Cobb is a historian, novelist, documentary filmmaker and professor of American history at Texas A&M University. Cobb provides interesting background on the telephone industry in the early 20th Century, and the role of women in making it work. But it would take the men leading America's military a long time to realize that neither gender has a monopoly on courage, competence, and willingness to sacrifice for their country. Edwin Grosvenor is the editor-in-chief of American Heritage and the author of Alexander Graham Bell: The Life and Times of the Inventor of the Telephone.